For the last few years I have grown a few vegetables in pots: spinach, tomatoes, dwarf beans and even a single runner bean plant. They have all done well, as have the odd lettuce and rocket. With my small garden I've relied on these pots (and the greenhouse), while keeping the main garden for lawn and borders full of flowers, as well as shrubs for attracting birds and insects (it's also nice to look at). This year though I have decided to expand the vegetable production and will be utilising two raised beds by the greenhouse for this purpose. I purchased a link-a-bord kit from Wiggly Wigglers and have today set it up. The kit itself took all of 5 minutes to assemble and is made from recycled uPVC. I think I would have preferred wood but this kit is light, simple to assemble and won't rot. I didn't fancy the back breaking job of digging up the turf so laid some cardboard on top of the grass. This should stop the grass growing through yet still allow the bed to drain well. 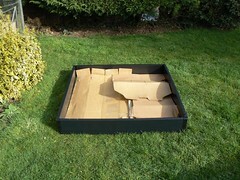 By the time the season is over the grass should be dead and the cardboard rotted enough to just be dug over like a normal plot (well that's the theory anyway). 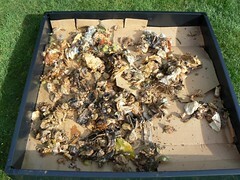 Next came a bucket of Bokashi for the base followed by a layer of home made compost from my third bin. Both these will add nutrients to the soil as well as help stop the soil drying out. I did exactly this in my pots last year and had the best crop of veg ever, even though our summer was atrocious, so I'm sure that it will help just as much this time around. 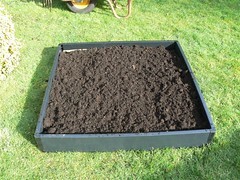 Finally I topped it off with some John Innes multi purpose compost as that will be ideal for planting the veg plants into. Once established in this the roots will find their way down to the compost and Bokashi and all the nutrients they contain will keep the plants fed and healthy. 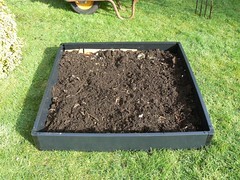 The second raised bed kit is on order and I'll be setting that up next to this giving me quite a bit of growing room. I'm hoping to utilise this room properly once I've read Growing Fruit and Vegetables on a Bed System the Organic Way by Pauline Pears. 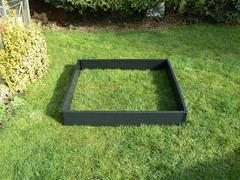 I am looking to make a raised veg bed in my garden, is it advisable to place a layer of broken stones to help drainage? Also is it advisable to use a weed protector membrane across the whole base or just at the edges?